Guess What Yesterday Was? 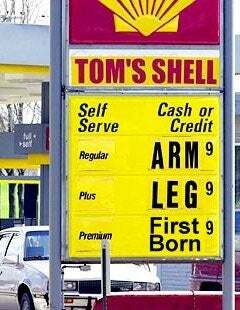 Record High Gas Prices Day! Hurray! Another day, another record high price. Oh wait, this is one of those bad records, isn't it? Well, it is still an all time high. How high? How does $3.196 (which is a fancy way of saying $3.20) for a gallon of 87 unleaded strike you? Well friends, that's what it costs nationally as of yesterday, May 21 [Update: American Public Media's Marketplace reported that the price is actually $3.22 per gallon – see here]. We've covered the whys of these highs before, but basically demand is very high and there aren't enough refineries operating in the US. Sticking with that last point, many refineries are not in action due to planned closures. I remember talking with a friend of mine who works for the Los Angeles Department of Water and Power during the Enron/rolling blackouts debacle. I asked him why so many power generators were taken off line for "maintenance" right at the start of summer. "To drive up prices — especially since all the repairs have historically been done during the winter." But we're not calling the oil companies greedy. We know this whole "summer driving season" thing is new for 2007.